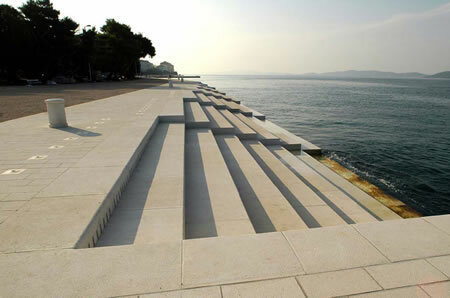 The Sea Organ (Croatian: Morske Orgulje), a piece of architecture designed by Nikola Bašić, is located in Zadar, Croatia. Unveiled in 2005, the organ–made of 35 polyethylene pipes beneath white marble steps–turns the wind and waves into a never-ending stream of sounds. The Sea Organ won the 2006 European Prize for Urban Public Space. This entry was posted on August 21, 2016 by Vox Populi in Art and Cinema, Music and tagged Morske Orgulje, Nikola Bašić, The Sea Organ, Zadar Croatia.